And here is what I did with it, in a matter of minutes too! Card base is Early Espresso. Like it, darker than Chocolate Chip, but definitely a color I can learn to love!! Background is Cherry Cobbler textured with the new Vintage Wallpaper embossing folder. Ovals for the main image were cut with the Ovals Big Shot die. Image is from Fast & Fabulous, a Level 2 Hostess set. It's been a very long time since I've used a hostess set this much-usually mine just collect dust or wait in the door prize pile! Really like this one. I stamped the outline image in Early Espresso, then filled it alternating Cherry Cobbler & Daffodil Delight. Saying from Sincere Salutations. 1/8" Daffodil Delight taffeta ribbon is the final accent. That's it for tonight, hope to be back soon!!! Happy July 4th in case I don't make it back until after that!! I really like the combination of colors you chose. That might be contagious as a pairing. Your card is beautiful. Thanks for sharing. Oh Jennifer! 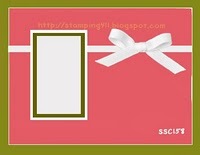 I LOVE this pretty card! Great combo, must get that colour coach! I love the Vintage Wallpaper embossing that you did for your card. Now if mine would only get here so I could make something as pretty as you did. Love that color combo...the new color coach ROCKS!! 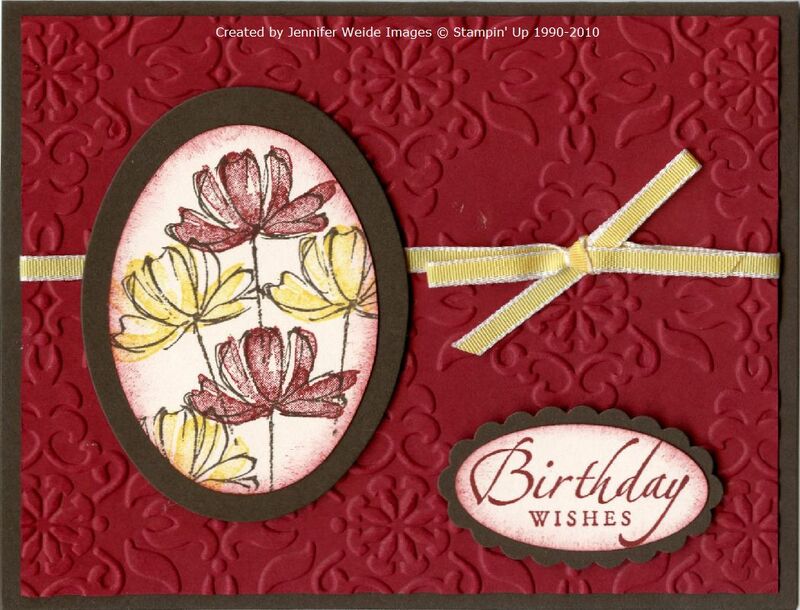 Great quick card, hopefully you can get your cleaning done quickly & get back to stamping! Love the colors with the stamps you used! Great job! Total exhale when I got to your site.. The color scheme is just amazing! Get down with your bad self, this is amazing!